Of course I expected differences between US-American and German households when I began my exchange experience. What I did not expect was for this difference to manifest itself in the form of tissues. Tissues? Yes, the approach to nasal hygiene management across the pond is quite different. In my house in the United States, tissue boxes could be found in every bedroom and bathroom, the kitchen, the garage, and other popular spaces around the house. I found it very surprising when I arrived in Pinneburg and couldn’t find a single tissue box in my temporary home. The other US-American exchange students in my OLC also experienced the same confusion. 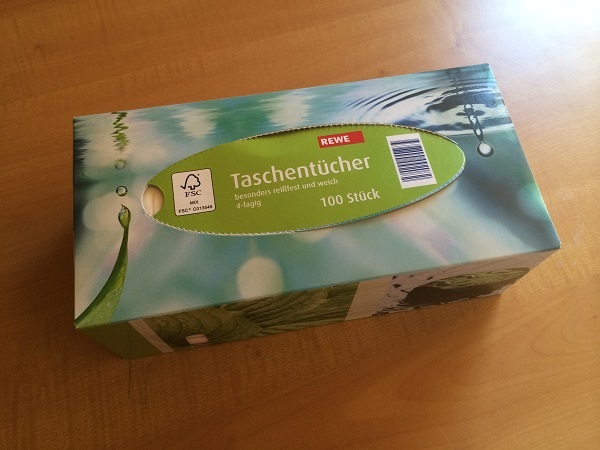 To facilitate the expulsion of mucous from the nasal passages, Germans* instead make heavy use of pocket tissues. I survived for two months using these (as well as toilet paper and napkins), but I recently gave in to my American comfort. *A very broad generalization. However, it is based on my experiences with two different families and hearing about the experiences of fellow exchange students. Ha so the opposite for me! With a family of 8 including me, there are close to a thousand tissues in this house (that’s not an exaggeration)!